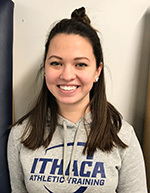 My name is Katelyn Dolan and I am a senior at Ithaca College in Ithaca, NY. I am the current District 2 representative on the NATA Student Leadership Committee. It is my goal to share information with all students within D2 and help anyone interested get involved, whether it be on a state or national level. I am proud to represent such a great district! Make sure to subscribe to the AT Student quarterly e-newsletter and the D2 Student Corner (automatically subscribed if D2 member) to stay up to date on news, scholarships, and events, and please do not hesitate to contact me with any questions! The mission of the NATA Student Leadership Committee (SLC), is to represent and advocate for students, create and promote professional development opportunitues, and encourage student engagement in the athletic training community. if you are interested in representing your district on a national level, applications will be open in late September/early October. Feel free to contact me with any questions! The District 2 Student Corner is used by the District 2 student representative to the NATA Student Leadership Committee to spread knowledge of current events within the athletic training community and future events hosted by District 2. These emails will be filled only with information the representative feels all students should know and would be completely separate from the D2-Wire, which is intended for everyone in the district. Messages are sent on an as needs basis. Join the Student Leadership Committee on Twitter, Facebook and Instagram. Network with other students by joining the NATA Athletic Training Student group on LinkedIn. To help more students attend the NATA Clinical Symposia & AT Expo, the NATA Student Leadership Committee is now offering the Chuck Kimmel First-Time Attendee Award. This award will provide a total of $2,000 in award money to two to four athletic training students who have never attended the annual convention. Chuck Kimmel First-Time Attendee Award applications are accepted between Feb. 15 and April 15. The NATA Foundation Scholarship Program, which is managed by the Scholarship Committee, awards undergraduate, master’s and doctoral scholarships. The number of scholarships varies annually (from 50 to 75), with the amount of the award currently $2,300 per scholarship. Scholarship funding is secured through a variety of sources, including the organization’s endowment program, as well as through corporate and individual support. Scholarship winners are awarded during the Pinky Newell Scholarship and Student Leadership Breakfast at the NATA convention. The Commission on Accreditation of Athletic Training Education (CAATE) is responsible for evaluating three different types of educational programs in athletic training: Professional Programs, Post-Professional Degree Programs and Post-Professional Residency Programs. The CAATE website offers a tool that allows you to search all of the accredited programs at each level. The Bobby Gunn Student Leadership Award was established to recognize one of the true pioneers in athletic training -- and to give deserving students assistance in attending the NATA Convention. The NATA Quiz Bowl is an annual competition that takes place at the NATA convention. The event features ten teams, one representing each district, competing in a Jeopardy style format. Questions range from athletic training history to medical diagnoses.